The popular Nickelodeon characters known to millions of children worldwide will spend time in Niagara Falls as the Falls Avenue Resort celebrates the holidays. The 20 acre Falls Avenue Resort will welcome Dora the Explorer and her adventurous cousin Diego to Niagara Falls, Ontario at the end of December. Their visit to North America’s Largest Hotel and Indoor Waterpark Complex comes as part of the Holiday Magic Winter promotion which features $250 free in bonus dining and attractions passes. 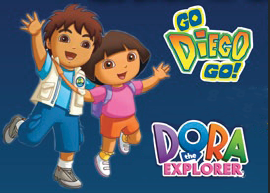 Dora and Diego have a busy schedule on the Resort when they visit December 27, 28, 29, and 30. They will start each day by greeting fellow explorers at a Kids Eat Free breakfast at the Rainforest Cafe. (reservations are recommended-receive a child buffet breakfast free for each adult buffet breakfast purchased) Guests are reminded to bring a camera to capture the moment as Dora and Diego will be posing for pictures. A free Meet and Greet session with the Nickelodeon stars is planned for 3:00pm daily. Free daily events are planned including face painting, cookie decorating, family movies each night and photo sessions with the Hershey Kiss, Reese, Pink Panther, and Nickelodeon superstar SpongeBob SquarePants. A yearly holiday tradition, guests of hotel arriving December 23, 2010-January 8, 2011 will receive the Ultimate Kids Package which features $250 free in dining and attraction passes for 4. Guests will receive the bonus passes by reserving either a Hotel Stay or Hotel Waterpark Package. Waterpark packages feature one night hotel accommodations, and 4 two-day Fallsview Indoor Waterpark passes. The Ultimate Kids Package includes Two $40 Fallsview Dining Gift Cards, Kids eat FREE Breakfast, Four passes to Tour Bus SWAT Team, Four passes for two movies each at 4D moving theatre (choice of: SpongeBob SquarePants, Glacier Run or Dino Island 2), Four passes to Wild Safari Mini Golf, Four passes to Jungle Friends Funhouse, Four passes to Traffic Slam Bumper Cars, and Four passes to MGM Great Movie Experience. Located directly across from the Falls, and in the heart of the tourist district, the Resort features popular attractions, first rate hotels, and spectacular dining options including the Sheraton on the Falls, Crowne Plaza Hotel Niagara Falls-Fallsview, Skyline Inn, Hampton Inn by Hilton at the Falls, Fallsview Indoor Waterpark, Adventure City, Hershey Store, Rainforest Cafe, Hard Rock Cafe Niagara Falls and Planet Hollywood.